Fine dining takes on new meaning at The Colonnade. Residents can enjoy both casual and formal dining options that rival 5-star culinary experiences. Every dining option offers something different, giving residents the ability to choose where their taste buds lead them. Varied cuisines, fresh ingredients, and exceptional menu choices mean that the expert Chefs are always cooking up something unique. With gluten-friendly and health-conscious options, residents are sure to find something to enjoy. 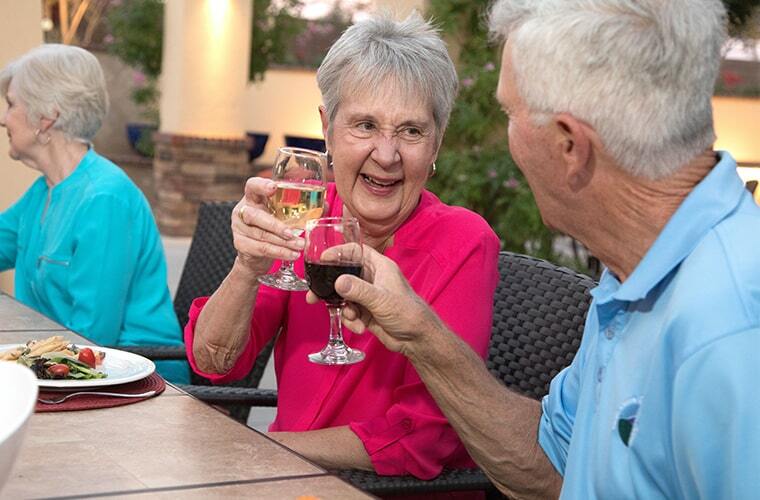 Families and friends are invited to dine with residents and enjoy a delicious meal at The Colonnade. A private area may also be reserved for special events such as birthdays, anniversaries, and more. 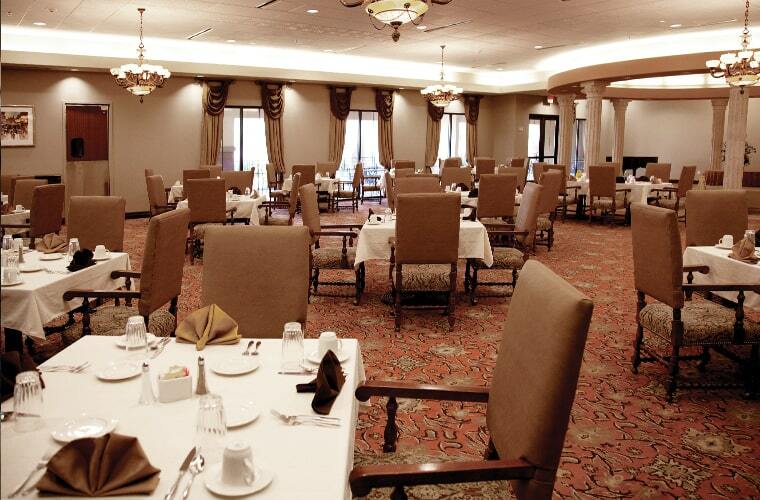 The Milano is one of The Colonnade’s formal dining experiences. Inspired menu choices ranging from classic comfort food to various ethnic cuisines make every meal one to remember. Sunday brunch is also a resident favorite, satisfying cravings for classic brunch staples and more. 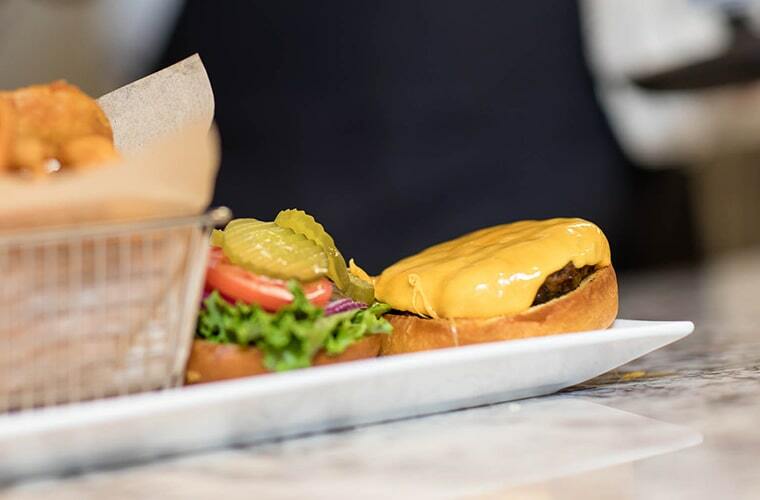 Monday: 4:30 p.m. to 7 p.m.
Wednesday: 4:30 p.m. to 7 p.m.
Friday: 4:30 p.m. to 7 p.m.
Saturday: 4:30 p.m. to 7 p.m.
Casual dining is at its best at The Bistro. Come as you want and enjoy delectable dishes for breakfast, lunch, or dinner in a relaxed setting. Monday – Saturday: 8 a.m. to 7 p.m.
Club Solé includes a gorgeous courtyard dining area with a brick oven made for serving tasty wood-fire pizza. Adjacent to the dining area is a cocktail lounge, making it the perfect setting for after-dinner drinks and socializing with friends. Enjoy high-quality cuisine in an elegant environment in either of The Colonnade’s two private dining rooms. Perfect for gatherings of any size and special occasions, both rooms are available for reservations. Residents can enjoy their meals outside on The Colonnade’s outdoor patio, which offers exceptional outdoor views. Patio dining is open when weather permits. 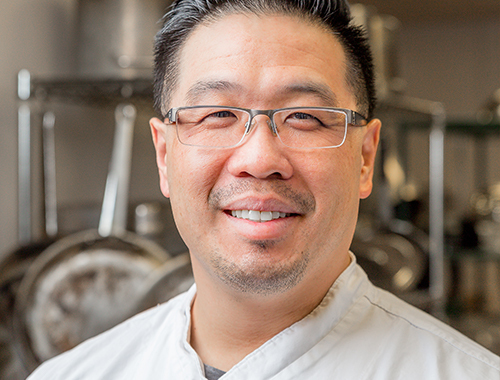 Executive Chef Kelvin Wong has been part of the Sun Health Communities team for six years and has 25 years of culinary experience. Chef Kelvin attended the nationally recognized California Culinary Academy, where he received his Associate of Occupational Studies (AOS) Degree. Today Chef Kelvin strives to accomplish something new every day through his culinary creations. Throughout his 15 years as a professional chef, Chef Kelvin has held many Sous Chef and Executive Chef positions, as well as multiple positions at Sun Health Communities: including cook, banquet cook, purchaser, Sous Chef, General Manager, and currently, Executive Chef. Chef Kelvin first decided to become a chef at the young age of 16 and has pursued his dream ever since, loving the fact that every day brings new experiences. He also loves to satisfy taste buds by preparing two of his favorite things: juicy burgers and cheesy, delicious pizza.